Bombay Karachi halwa is the famous Indian sweet. 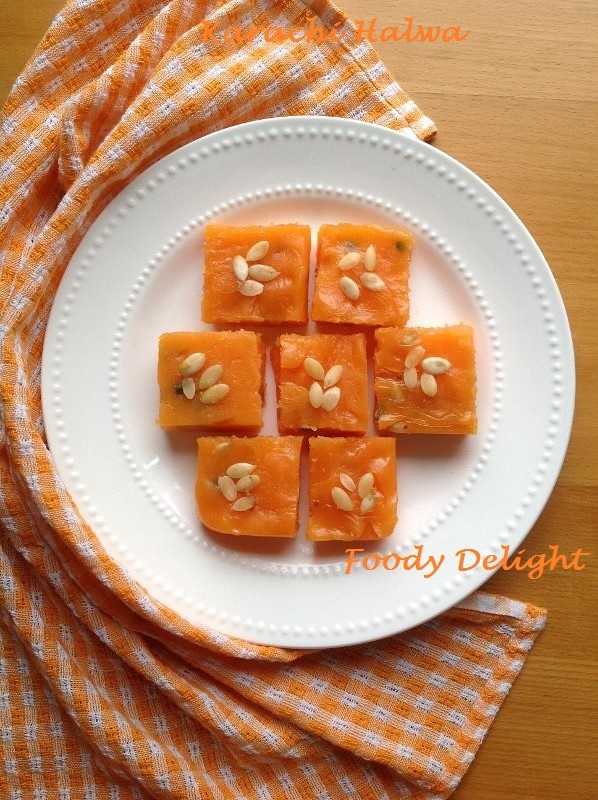 This halwa is soft delicacies with nutty flavours, melts in mouth and spread the cool feeling inside the mouth. Even though the Bombay has changed to Mumbai and Karachi has become a part of Pakistan,but the name of the sweet is still th same. Bombay Karachi Halwa is also known as Karachi halwa or bombay halwa. The day before you want to make halwa,combine corn starch,water and ghee into one bowl. Mix well and cover with the lid. Let the cornstarch soak in the water for few hours, preferably overnight. Combine the sugar and water into the pan and place it on the medium flame. Stir the sugar mixture continuously till you get 2 thread consistency of sugar syrup. Parallely boil the milk into another saucepan. When you get proper consistency of sugar syrup, add the corn mixture little by little at the time and keep stirring continuously . Add 3 tbsp of ghee and rose essence and mix well. The mixture will start to become thick. At this point stir in the boiled milk into the thicken mixture. Mix well and now mixture will become thin. Just after the few minutes with the continuous stirring the mixture will start to become thick. Now add remaining ghee, cardamom powder,chopped almonds and chopped pistachios.If your using food colour,add it at this point. Now continuously mix the mixture till you get the thick dough kind of mixture. Add about extra 1 tbsp of ghee to the mixture. The ghee will make the mixture smooth and gives the mixture a shiny look. Transfer the mixture into greased plate. Let the mixture cool down and then cut the halwa into desired pieces. 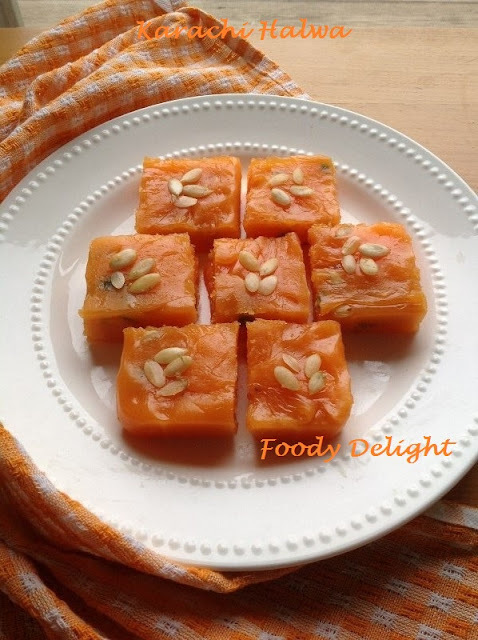 Garnish the halwa with the melon seeds. You can also prepare the Karachi halwa with all purpose flour or Maida. Add the nuts as per your choice. Always prefer to add hot milk to use in the halwa for consuming the time in the preparation. Nice colour... never try any halwa b4... does it taste like pudding? Mouthwatering dessert,halwa looks so delicious n colorful. 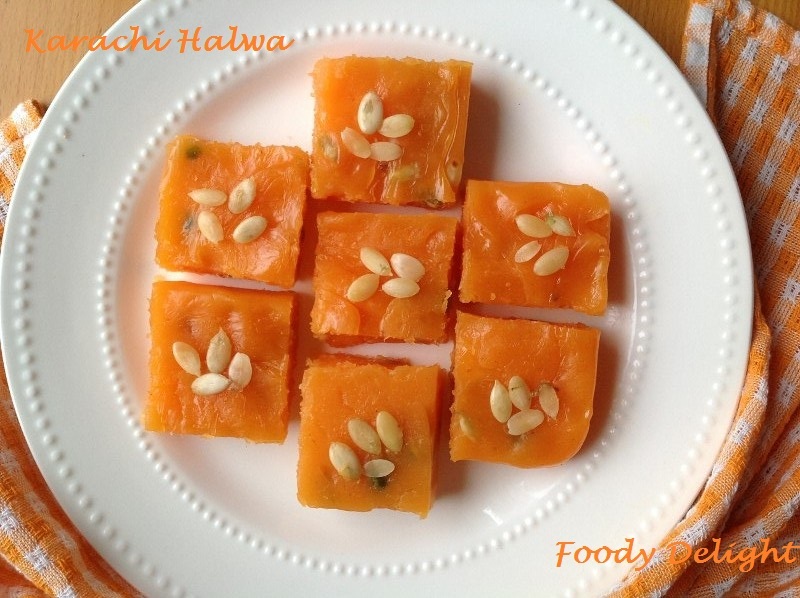 yummy halwa...my hubby loves this mithai..thanks for visiting my blog Pranjali. Wish to have some anytime, fantastic halwa..
Tengo dos amigas de la India aquí son dueñas de un restaurant y probé este exquisito dulce realmente lindo me encanta,saludos desde el sur de Chile.